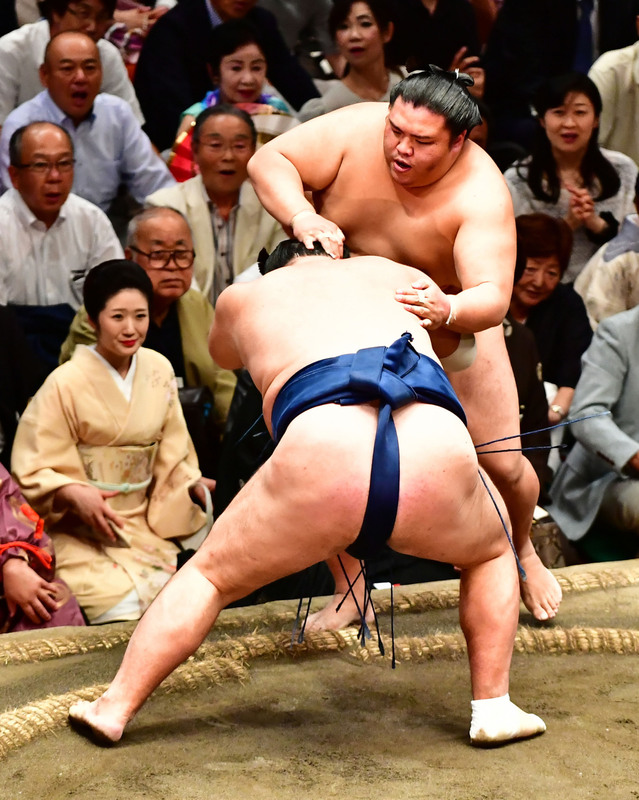 Mongolian yokozuna Hakuho and Kakuryu secured winning records Sunday, while their Japanese counterpart Kisenosato took a second loss on the eighth day of the 15-day Autumn Grand Sumo Tournament. 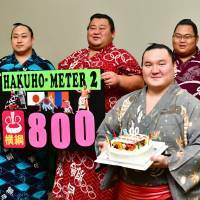 In the day’s final bout, Hakuho earned his 800th win as a yokozuna by defeating Yutakayama (0-6-2), who returned to the tournament after withdrawing on Day 5 with an ankle injury. 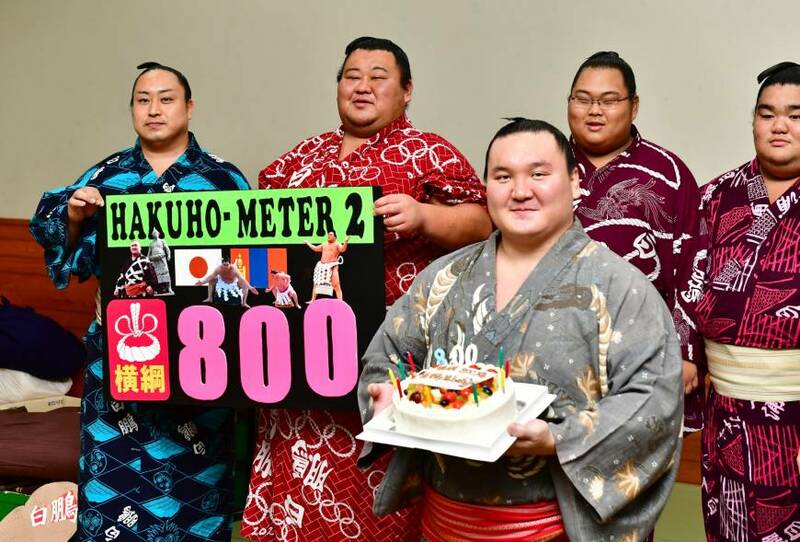 Hakuho dazed the No. 2 maegashira with a swift left-handed slap in their second career matchup, then hauled his opponent out of the ring with his favored left-handed belt grab. Kakuryu dug in low against his 227 kg opponent, sekiwake Ichinojo (2-6), and stepped on the gas at the ropes to edge him out. The Mongolian yokozuna are the only wrestlers with perfect marks at Tokyo’s Ryogoku Kokugikan. Kisenosato (6-2) took his second loss after being defeated by komusubi Tamawashi, who earned his first win of the tournament and third kinboshi prize for beating a yokozuna. The Japanese yokozuna, who was upset by No. 2 Chiyotairyu on Friday, got off on the wrong foot and allowed Tamawashi to capitalize for a quick push-out win. Ozeki Takayasu (7-1) was denied a winning record on Day 8 after suffering his first defeat in an upset loss to No. 3 Shodai (3-5). Shodai stood his ground and got his left hand underneath Takayasu’s armpit, spinning the ozeki down to defeat. Goeido (7-1) won an ozeki showdown against Tochinoshin (5-3) and earned his seventh straight victory. Goeido stopped the Georgian in his tracks and quickly rammed Tochinoshin over the straw. Tochinoshin is fighting as a demotion-threatened “kadoban” ozeki and needs at least eight wins to maintain his status at the next basho. Sekiwake Mitakeumi (6-2), looking for an ozeki promotion and a second straight top division title, was handed a second loss by top-ranked maegashira Ikioi (1-7). Ikioi got the better of the initial charge against Mitakeumi, pushing him out to break a seven-day losing streak and pick up his first win in seven career matches against the sekiwake. Komusubi Takakeisho (3-5) employed his shove-and-move shuffling technique against No. 1 Kaisei (3-5), but had trouble moving the second-heaviest man in the top division. Kaisei’s 207 kg worked against him, though, when Takakeisho thrust him down in an off-balanced moment. 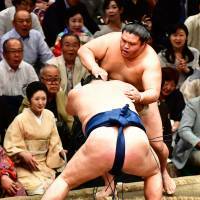 Ninth-ranked maegashira Hokutofuji (7-1) fell against No. 13 Ryuden (7-1) and suffered his first loss of the tournament. Hokutofuji struggled to find a belt hold against Ryuden and was gradually driven to the edge of the ring. Hokutofuji bounced back but failed to gain momentum against his charging opponent and was pushed out. Both wrestlers are the only rank-and-filers one win behind the leaders. In the day’s opening match, top-ranked juryo division veteran Aminishiki (5-3), who turns 40 next month, made a brief reappearance on the top stage in a bout against No. 16 Kotoyuki (3-5). Aminishiki, who was relegated back to the second division after posting a 4-11 record at the May tourney, got a solid two-handed grip on Kotoyuki’s neck and thrust him down to the clay, securing the victory with a rare “tokkurinage” winning technique. Kyokutaisei (1-3-4), who withdrew on Day 4 after suffering knee injuries, will return to competition Monday. It was the first time the No. 11 maegashira withdrew from a grand tournament since his professional debut in 2008.